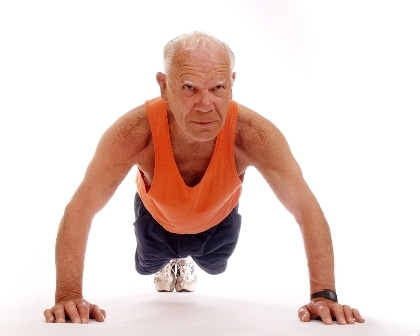 Axis Fitness » Functional Training and Seniors! Functional Fitness is one of the latest new ways of enticing you to join a health club as the best way of being able to gain strength, flexibility, weight loss and improve your aerobic capability. How many types of NEW & IMPROVED ways of getting strong, keeping fit and losing weight have you read and heard about over the years? Probably more than you or I could remember? So you start your training by using medicine balls, kettle bells, sandbags, heavy ropes and anything else that’s going to give variety, lifting, picking up and sprinting holding onto a ball, throwing it up in the air. Performing movements by an unfit, unconditioned person, exposes them to an increased risk of injury. The illusion of performing this type of “Functional Training” many times makes you believe the tasks you perform become “easier”, so you feel as if your overall physical strength, conditioning and abilities have improved. But have they really? The truth is you have increased your skill level at all those different activities, but does that mean you have increased overall strength, flexibility or muscle tone? Possibly. How much time and effort has been spent over the months to gain what is difficult to quantify and what percentage gains could you prove you have gained? Not sure? Well on average you may attend 2 to 3 times a week doing at least 30-60 minutes of exercise at pre-scheduled times when those classes are running. That’s 2 to 3 hours per week or 4 to 12 hours per month, invested in your strength and physical wellbeing. Do you really want to invest that amount of time for what is at best speculative improvement in your physical development? How about 20 minutes twice a week at a time you decide, not the time someone else has decided you can train and with GUARANTEED results? A great facility that is dedicated to the individual needs of each and every member. unlike the impersonal big name “corporate” style facility with all its costs and overheads reflected in high monthly membership fees. At Axis we offer sensible monthly payments to suit every pocket. A friendly atmosphere with access to an instructor at all times available for guidance and advice, including qualified GP Referral Qualified Instructors. The music is appropriate for those who remember GOOD MUSIC ! Open 7 days a week with Nautilus Equipment (as used in the majority of hospitals for rehabilitation and by most professional sports teams in America). Why Nautilus? Because Nautilus Sports Medical Industries spent over $500 million on research to ensure the development of anatomically correct machines that produce fast, safe and effective results for all shapes and sizes. If you don’t believe us, look up Nautilus and read about this equipment and its training guidelines. We have a large amount of Seniors training everyday mostly in the mornings. They are able to exercise safely, effectively and gain real strength and conditioning so that they can enjoy their later years doing fun things. No longer are they limited to what they do because of their physical capabilities. Most of our senior members are stronger than people half their age and can prove it with recorded workouts demonstrating their progress from when they first started. Ring us for a friendly chat about what we offer and what you need to achieve and enjoy life.